Alberto “Beto” Cardenas Jr. serves as a lead attorney at Vinson & Elkins LLP, working on a range of legislative matters including immigration policy, regulation, and patent reform. 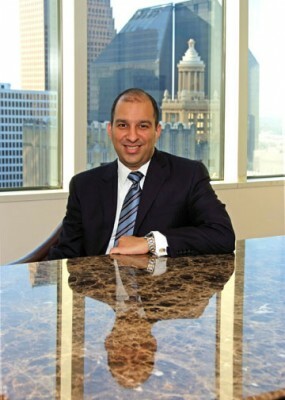 Cardenas Jr. divides his public policy efforts on counseling businesses affected by US immigration laws as well as advising corporate and academic clients. Prior to joining the 750-person firm, he was general counsel to Senator Kay Bailey Hutchison. Cardenas chats with Hispanic Executive about finding success in DC and coming back home to Texas. Growing up in the small town of Laredo, TX, Alberto “Beto” Cardenas Jr. would spend his summers in the local courts, watching litigators work their magic—a childhood pastime that would later prove prophetic. I grew up in south Texas in the town of Laredo. Both my parents were college professors. I can go back and look at my eighth-grade yearbook and under career choices, it actually says corporate attorney for me. During the summers in a small town like Laredo—there were barely 100,000 people then—your options were not as diverse as they are now. I would go and sit in district court or federal court and watch the attorneys that were litigating those cases. I ended up grasping an admiration for their work. I consider my heritage a strength for me, because the world is not one where uniformity is a desire for anybody. I think there is an understanding of where you came from. As in many cultures, family and faith are at the center. From birth up until I was three years of age, I did not know a word of English. And these are college professors with graduate degrees who teach and work in the English world. But they made it a point to make certain my older sister and I knew how to read, write, and speak in Spanish. Not because that was the language of the future, but when you ask what my heritage means to me, there is a sense of pride with my culture and also a sense of accomplishment to work in an environment that is cross-cultural. That is an asset that employers and future clients consider an advantage. I did a couple of stints in Washington, DC. I served as an intern in the office of Frank Tejada, and I learned a lot watching him. Second, I was working with the Clinton/Gore reelection campaign in ’96. I learned a lot and got to see how the operation ran. Then I got into law school. In 2001 I finished law school and clerked for a federal judge and then worked for the Texas Tech University system and was asked to open up their Washington, DC office. I did that for about four years, securing federal dollars for their research projects, enhancing relationships with members of congress, and ended up joining Senator Hutchison’s office. There comes a point when you grow up and you realize that you can either want to be home or you can stay and make a career in Washington, DC. I chose to come home. There were various law firms I considered but V&E provided me with the best tools to enhance my career practice. I picked Houston because it’s the biggest and the best. As for my future, I have a road map of where I want to be as an individual. I want to make certain that businesses have an environment to grow and are not hampered by government. I like to look at problems and find a solution. If its immigration policy, making sure we are getting things right so you are not hampering growth. I focus a lot on the public policy aspect of clients and how I can best address their problems or needs.